​Excess Flow Valves automatically shut off the gas to your building when there is a break in the line. Excess Flow Valves contain a float which is held back from blocking gas supply by the back pressure that normally builds up in a line from normal use. When a line breaks in the building somewhere downline of the valve, the gas flows quickly and the pipe loses the back pressure which has been holding the valve float back. The valve float moves up to block the line and cut off the supply of gas. Once the line is fixed, back pressure is restored and the valve automatically opens again. Many Jurisdictions in California require installation of excess flow valves to be installed in houses and buildings that are sold, newly constructed or remodeled. Insurance companies support and recognize the value added protection to the homeowner and many of them offer sizeable discounts for installing these gas safety valves. 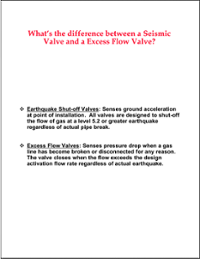 Excess Flow Valves are activated by the unrestricted flow of gas, resulting from a break or rupture in the gas line. This flow causes the valve to trip (shut down). The flow of gas is then automatic reset once the gas piping has been repaired. ​​Excess Flow Valves contain a float which is held back from blocking gas supply by the back pressure that normally builds up in a line from normal use. When a line breaks in the building somewhere downline of the valve, the gas flows quickly and the pipe loses the back pressure which has been holding the valve float back. 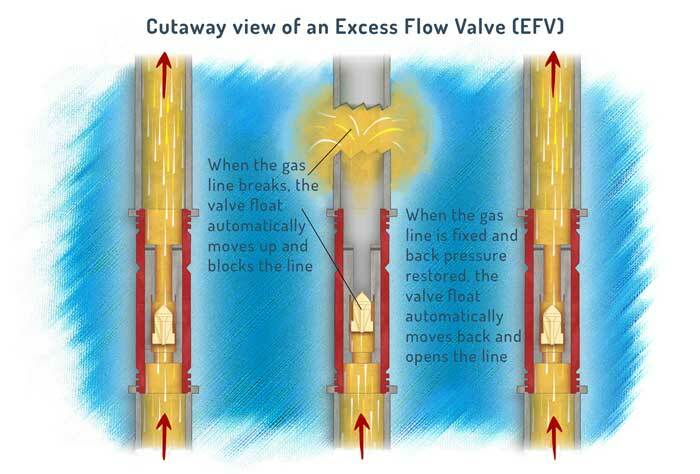 The valve float moves up to block the line and cut off the supply of gas. Once the line is fixed, back pressure is restored and the valve automatically opens again.